Reece Give Me Some Peace!, Sonia Bestulic (author), Nancy Bevington (illus. ), Big Sky Publishing, September 2018. A fun-loving book about the wonderful world of music and noisy play! Cheeky Reece loves making music. His mother prefers it a little quieter, but her pleas for quiet only make him louder… and louder! How many instruments will Reece play? Will his mother ever enjoy some peace? Join Reece on his noise filled musical journey! How can anyone expect a world of quiet when there are so many zang zeng zings, woot toot hoots, and ving vong vangs to explore?! A world where the perum pum pums and cling clang clooms bring so much joyful musicality and intellectual development to one’s mind! Reece is never short of instruments to test out his sound awareness, but his mother is close to the brink of cacophonous madness… will the noise ever end? 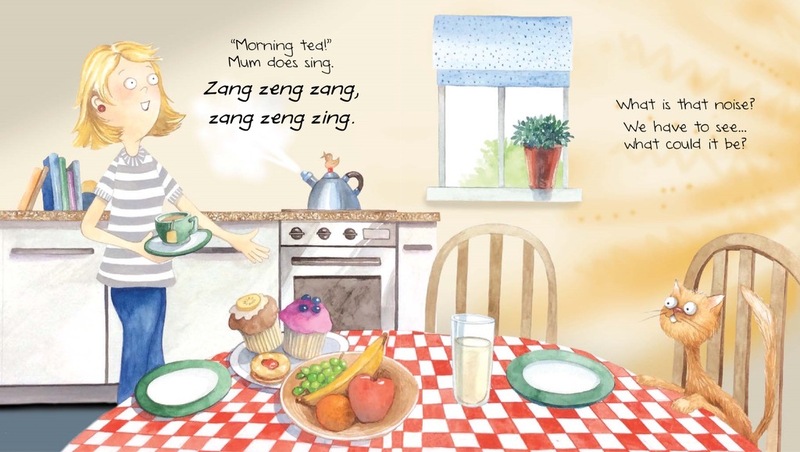 In this comical riot of rollicking rhythm, amiable alliteration and an onomatopoeia oomph, author Sonia Bestulic cleverly integrates an auditory blend of language patterns and play with words. Her story, including Reece’s instrumental pitch, and his mum’s instrumental frustration, build up like a rising crescendo to a dramatic climax, and then fall softly to a satisfying, ‘peaceful’ finale. Nancy Bevington does the same with her brilliantly supported illustrations; with colour and movement that become more intense, and characters shown either in their element or in their exasperation (I love the inclusion of the poor, jittery cat). The blue and yellow hues aptly create this sense of contrasting opinions on volume, flashed with white sparks of energy emanating from every page. From a xylophone to a flute, a violin, trumpet and more, the exuberant young Reece showcases his talent and encourages his early years audience to join in and make their own instrumental discoveries, too. My Miss 5 loved the prediction and anticipation of the oncoming piece (and peace), which kept her in suspense until the end. And for parents who can absolutely relate to their words falling on deaf ears, well, they’ll enjoy this one as well. Reece Give Me Some Peace! is a delightfully energetic and reverberating romp that will surely be played over and over in your household, as it has been in mine! Sonia speaks up in a fascinating interview over at Boomerang Books! See you there! 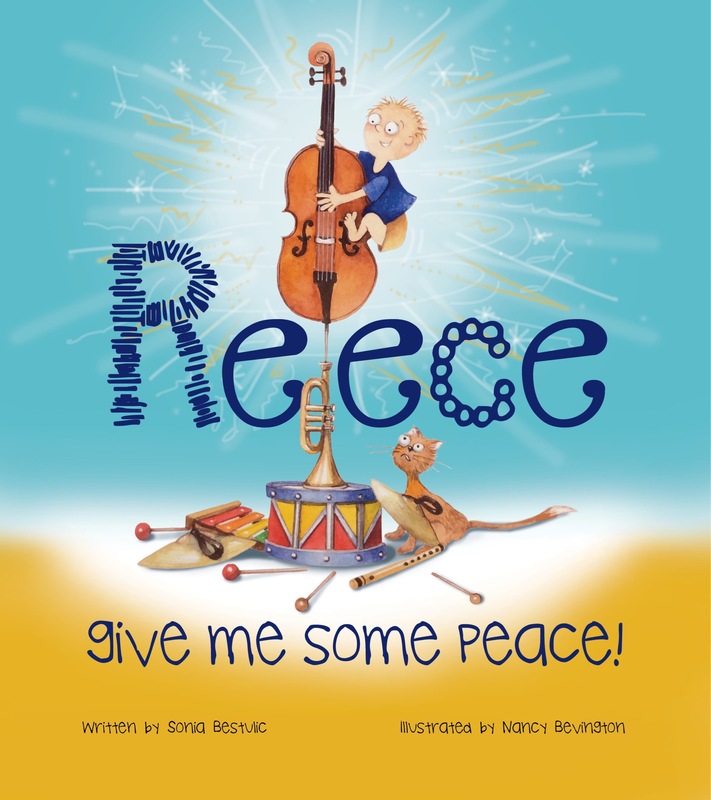 Have yourself at a BLAST at Sonia’s Book Launch for Reece Give Me Some Peace! 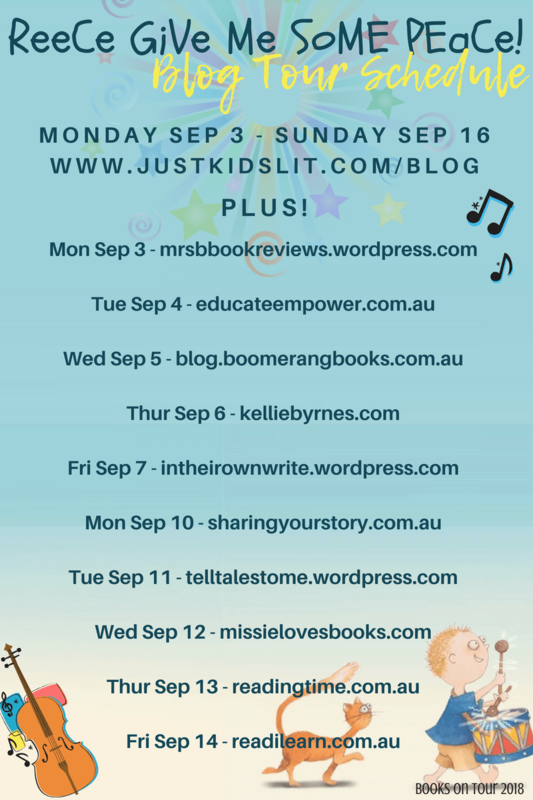 If you love music and noisy play then this book giveaway is right up your jazzy alley! Click the image to enter.